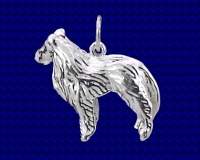 Sterling silver Collie dog charm. The collie apart from being kept as a pet is traditionally used as a herding dog working with sheep and cattle. It originated in the north of the United Kingdom and the most famous example of this breed is Lassie who starred in a popular book and then went on to films and television. 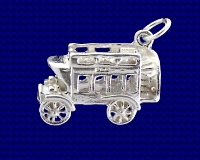 Craftsman made Sterling silver Collie charm. Approx. size 18mm x 21mm.